Agility. Precision. Performance. That might sound like a commercial, but actually, it’s a promise. Our core commitments to our customers. No matter the size, no matter the complexity, Buckley Roofing has the knowledge and track record to ensure that your next project not only looks great, but also remains on schedule and on budget and withstands the test of time. Exploration Place tasked Buckley Roofing with creating a single complex with two arching roofs that bowed in opposite directions and contained 72 skylights. Coming in on time and under budget, our crews implemented the challenging design flawlessly. Buckley was chosen to restore the Davis Hall roof system at Friends University due to our experience and success in restoring historical roof structures. Deteriorating materials, shifting structures and Kansas wind sought to derail the project, but Buckley crews delivered a magnificent product, which remains a source of campus pride for the university. The building was built in 1915 and careful procedures were necessary to remove existing flashings without damaging the structure. This building reflects the choice of tan TPO. 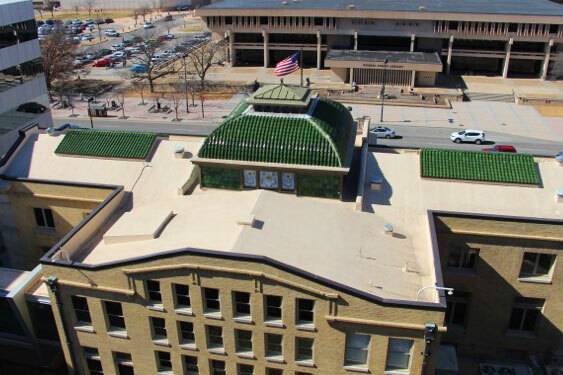 Buckley Roofing installed metal flashings that blend into the building while still protecting the structure and allowing for ease of maintenance for the next 100 years. The Dermatology Clinic acquired the building next to their current location in order to expand. They remodeled the entire building and built a corridor to join the two buildings together. The existing roof was a fully adhered EPDM installed directly to ridged ISO insulation, and was leaking in multiple locations. During the remodel process the Buckley team worked with the general contractor to keep the building water-tight. 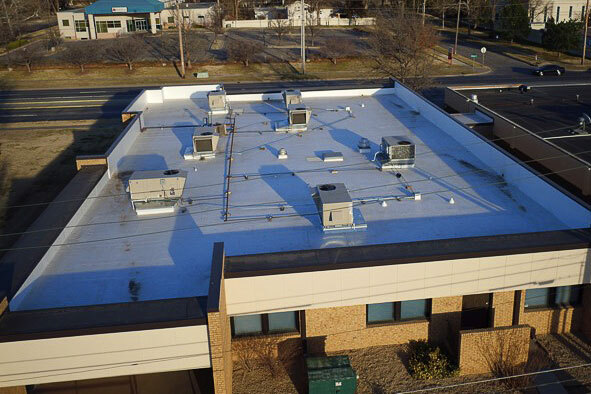 Buckley Roofing was able to provide SurgiCare of Wichita with a turnkey project. 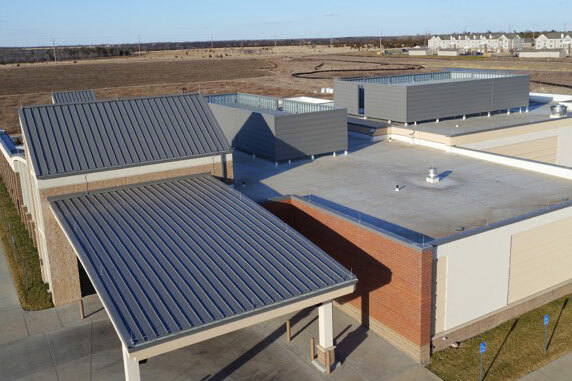 This roofing project required a TPO membrane system on the main roof, curved metal panels on the standing seam roofs, and metal panels on the screen walls.